Philippine Lawyer Faces Death Threats After Filing Case At The Hague Against Duterte : Parallels Jude Sabio filed an International Criminal Court case against President Rodrigo Duterte for crimes against humanity in the war on drugs. "I'm afraid that I'll be killed at any time," Sabio says. Jude Sabio displays the communication he submitted to the International Criminal Court. He says he felt it was his duty to bring President Duterte's war on drugs to the attention of prosecutors. Philippine lawyer Jude Sabio doesn't get out much these days — not after he accused his country's enormously popular president, Rodrigo Duterte, of crimes against humanity at the International Criminal Court in The Hague. "Nowadays I do not go out so much in public places," Sabio says. "Specifically, I'm afraid that I'll be killed at any time. Somebody will be just coming and pump a bullet into my head." The stocky Sabio, 51, says he's received numerous death threats since he filed a complaint against Duterte with the ICC in April 2017. Individuals are able to bring crimes to the attention of the ICC's prosecutor, who can then choose to investigate. Even more threats have come since ICC Prosecutor Fatou Bensouda announced in February that her office had started a "preliminary examination" based on Sabio's complaint. 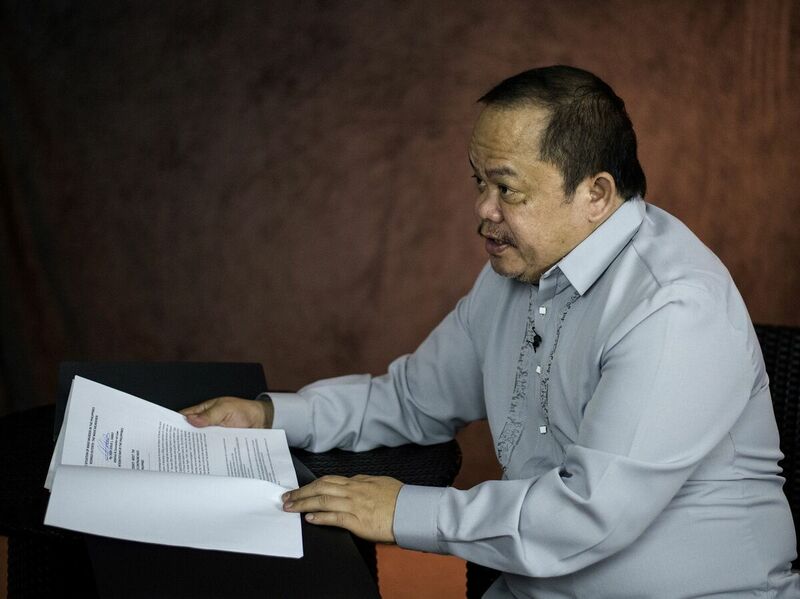 "I would say that I am being viewed now as the foremost villain in the country because I had the guts and the courage to file a case against the president in the ICC," Sabio says. Sabio is living in Manila and has for more than a year. He can't go back to his home in Mindanao, he says, because he's afraid he'll be more vulnerable there. Human rights groups say Duterte's war on drugs has left more than 12,000 dead since it began a few months after his election in 2016 — many attributed to so-called extrajudicial killings that Duterte's critics say he encouraged. The president denies he encouraged police or vigilantes to carry out any extrajudicial killings, though some of his other public statements seem to contradict this. And Duterte was initially dismissive of the case Sabio filed. Until the ICC accepted the case, that is. "I felt elated and vindicated," Sabio says, "because many critics said that the case would just be thrown into the garbage. And in fact, [the ICC] announced a preliminary investigation in record time." A month later, Duterte announced that the Philippines was withdrawing from the ICC. But rights experts noted that the withdrawal process takes a year and the Philippines can still be prosecuted for international crimes that took place while it was an ICC member. "I view that behavior of the president as an indication of his fear of the ICC," Sabio says. "He fears the ICC because he knows he is guilty of what he has done." Sabio admits he's an unlikely candidate to bring such a high-profile case. "I would just like to emphasize that I was not a human rights lawyer in the usual sense of the term," he says. "No, I was just a litigation lawyer or a court litigation lawyer for a long time since I graduated from the UP [University of the Philippines] College of Law. I handle the ordinary cases, but I thought to myself that in handling these ordinary cases I would be prepared for something big in the future." So how did a low-profile litigator become involved in the case against Duterte in the first place? Blind luck and a bad ticker, Sabio says. "I underwent angioplasty in June 2016, and while I was recuperating from my angioplasty, I heard about Edgar Matobato," he explains. "And I believed in the testimony of Edgar Matobato." Matobato was a self-described hit man for the so-called Davao Death Squad, which he says operated during Duterte's more than two decades as mayor of Davao City. Matobato testified before the Philippine Senate along with former Davao policeman Arturo Lascañas about their involvement in the death squad. When Sabio heard that Matobato had no lawyer, he volunteered. The testimony of Matobato and Lascañas became the basis of Sabio's complaint to the ICC. "Based on the testimony of Edgar Matobato and Arturo Lascañas, it is already an established fact that there was a system of death squad killings in Davao City," Sabio says. "And based on the pronouncements of President Duterte when he was still mayor, a presidential candidate and even as president, it's clear he continued the system in the war on drugs." Matobato is now in hiding. Lascañas has fled the country. Sabio says he's constantly looking over his shoulder. President Duterte's spokesman, Harry Roque, a former human rights lawyer, declined to comment for this story, but in the past has called the ICC complaint the work of "domestic enemies of the state." Duterte's supporters dismiss Sabio as a political stooge, a front man for one of Duterte's detractors, Sen. Antonio Trillanes IV. Sabio angrily denies the accusation. "I went to the ICC as an independent lawyer, practicing law on my own," Sabio says. "It just so happens that Sen. Trillanes and I have the same conviction. But it doesn't mean that I am a lackey or I'm a puppet of Sen. Trillanes. I'm not." But Sabio says he is scared. And broke. He still hasn't paid off his heart operation from 2016, and his work is suffering as he tries to maintain a low profile. Even so, he says he has no regrets. "I'm doing this because this is the right thing to do," he says. "And the only way that we can achieve justice against the president is to bring this to the ICC, because there is no way that this can be done in the country right now." It's a long shot. The ICC has received thousands of complaints since its inception. Fewer than a dozen have gone to trial. Sabio doesn't care. He thinks this one will. And when it does, he says, he's confident President Duterte will be found guilty of crimes against humanity.